Nic Fiore, Glacier Point Hotel innkeeper and fire builder from 1954 and beyond, remembers that his normal routine was to start gathering bark for the fire between 4:30 - 5:00 am, so it could be done before tourists arrived to enjoy the view of the valley from Glacier Point. He would build the fire with 10 wheel barrows full of red-fir bark. Even that early in the morning, invariably someone would want to take a picture with him holding up one of the pieces of bark, and he would never disappoint them. The fire would be started at 7:00 in the evening so that it could burn down to glowing embers by 9:00. Down at Camp Curry, the crowds would start to gather at 6:00 in the evening to get a seat at the outdoor stage, and would wait two hours for the show, which ran from 8:00 to 9:00, ending with the Firefall as its finale. The fire builder on Glacier Point and another individual near the Camp Curry stage would signal to each other by flashlight. When contact was made, the calls would begin. The fire caller at Camp Curry would yell in a loud voice: "Hello Glacier!" In the dead silence, the crowd could hear the faint response from the cliff: "Hello Camp Curry!" The fire caller would then yell: "Let the Fire Fall!" And the crowd could hear the final response: "The Fire is Falling!" At that point the fire would be gradually and consistently pushed over the edge. Great care was taken to ensure that the embers were pushed evenly off the edge, to simulate a steady flow and produce the illusion of a waterfall of fire. "Then there would usually be a pause, and I have seen many people cry at the end of the program. And it would be what would seem like minutes, although it was probably 30 seconds or so, then there would be the sound of a few people bold enough to clap, to break what was really almost a spiritual experience. And then pretty soon the crescendo of the clapping, and you could hear the clapping from the meadows, and then from all over the valley." In 1954, the year I was born, Yosemite National Park visitors exceeded 1 million for the first time. 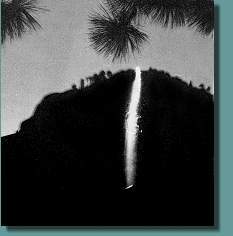 The Firefall was a well-established tradition by the time my family began to visit the park, and was viewed by more and more spectators each year. As a child, I remember the excitement of the Firefall. The crowds would begin to gather for the nightly campfire at Camp Curry early in the evening, and as the time for the Firefall approached, the anticipation was almost unbearable. What impressed me the most was when the fire caller asked the crowd for silence, and the exchange of calls began. I was astounded by the fact that the human voice could carry so far to the top of that cliff, over 3,000 feet into the night sky. It was almost unbelievable! And then it fell, looking nothing like the time-exposure photography that would appear on postcards, depicting that solid line of orange extending down the cliff. Instead, it would be little sparks -- thousands and thousands of individually discernible sparks -- floating down the cliff in complete silence. It took me some time to write those last paragraphs, because each time I made a revision and read it back I would get very emotional. When I first started researching this project, I experienced similar moments, fighting back tears (or not) while fleshing out the story of this tradition. At first I felt a bit silly getting so worked up about it, until I viewed a documentary about the Firefall, and saw Bill Lane (quoted above) moved to tears by the time he ended his account. The interviewer's voice was breaking as well! What is it about these memories that make their retelling so poignant and moving? 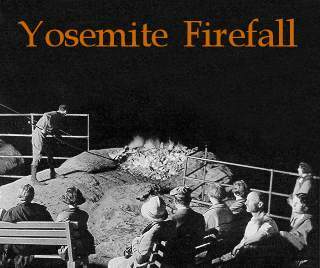 My best guess is that the Firefall was not just a spectacle, not just entertainment. Instead, it approached the sublime in the way that it touched those who witnessed it. Thousands of onlookers felt something in common for that short period of time. It was something parents shared with their wide-eyed children, and something that those children would never forget. It illustrated how grand Yosemite really was; how unspeakably tall were its cliffs; how quiet its forest; and how much we treasured the company of our family and our friends.